1 min read . Updated: 04 Dec 2008, 11:29 PM IST Sruthijith K.K. 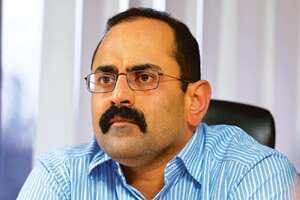 New Delhi: Rajeev Chandrasekhar-owned Jupiter Entertainment Ventures is in talks to buy a stake in INX News Pvt. Ltd, the firm that runs the news channel NewsX, said two persons familiar with the development, who asked not to be named. One person said the potential purchase of partial stake in INX Media Pvt. Ltd, the broadcaster of general entertainment channel 9X and music channel 9XM, was also under consideration. Jupiter Entertainment, a unit of venture capital firm Jupiter Capital, has interests in FM radio and television broadcasting. It recently entered into a joint venture with Star India Pvt. Ltd to form Star Jupiter, which now owns Asianet Communications, a southern broadcast network that operates general entertainment channels in Kannada, Telugu and Malayalam. Jupiter Entertainment has performed due diligence on INX News. One of the persons, however, said the price expectations were high and unrealistic under present market conditions. In an August interview to Mint, INX Media chairman Peter Mukerjea said the firm was looking to raise $150 million and hoped to complete what would have been the second round of funding, by December. When asked if his firm was in talks with Chandrasekhar for a potential acquisition, he said on Thursday: “I haven’t had any formal conversation with Rajeev Chandrasekhar regarding a potential sale of any business." Business Standard reported on Thursday that DB Corp., publisher of Dainik Bhaskar, was in talks for a potential acquisition of INX News Pvt. Ltd, citing unnamed people.